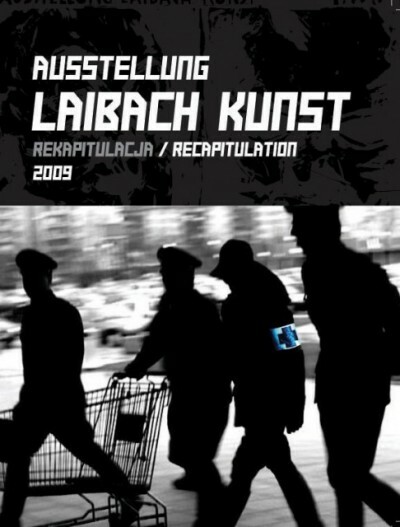 The Palac Sztuki museum of modern art in Łodz has finally released the catalogue of the Laibach exhibition held in the museum from May 26th until the end of August 2009. The full colour catalogueAUSSTELLUNG LAIBACH KUNST REKAPITULACJA / RECAPITULATION 2009 includes selected Laibach visual works from the end of 1970 until today, and separately presents works and installations from the Łodz exhibition. The catalogue also includes the most important manifestos and other Laibach texts, as well as rare photos and documents from the exhibition opening. The catalogue presents nine essays discussing Laibach, authored by Wiktor Skok, Taras Kermauner, Lev Kreft, Slavoj Žižek, Aleš Erjavec, Alexei Monroe, and Eda Čufer. All texts are published in both Polish and English. The catalogue is now available at the Laibach WTC shop. Laibach’s Łodz exhibition was included in Kasia Zalewska’s Top 10 shows in Poland in 2009, published on the Saatchi Online Magazine. The exhibition at the Palac Sztuki museum together with the Laibach concert (Die Kunst der Fuge) at theŁódzka Filharmonia im. Artura Rubinsteina (Arthur Rubinstein Łodz Philharmonic Venue) was also nominated by the important Łodz Gazeta newspaper for the best cultural event of 2009 in Poland.